“In case you don’t know (and if you’re curious about how the original characters look like), this is a fan art of Japanese manga/anime called ‘Fairy Tail’ and the characters’ names are Lluvia Loxar (commonly known as ‘Juvia’, there are many alternative spelling to her name) and Gray Fullbuster. OK, Before you go on reading this I would like to thank Moogle for doing an extra critique for crit night. It just so happens that the person who was actually assigned FF’s image “falling” hasn’t submitted theirs yet, so this was great save. Thank you moogle! Cute idea, but the background and umbrella (especially) caught my attention more than the 2 people. 2. What do you like about this image? 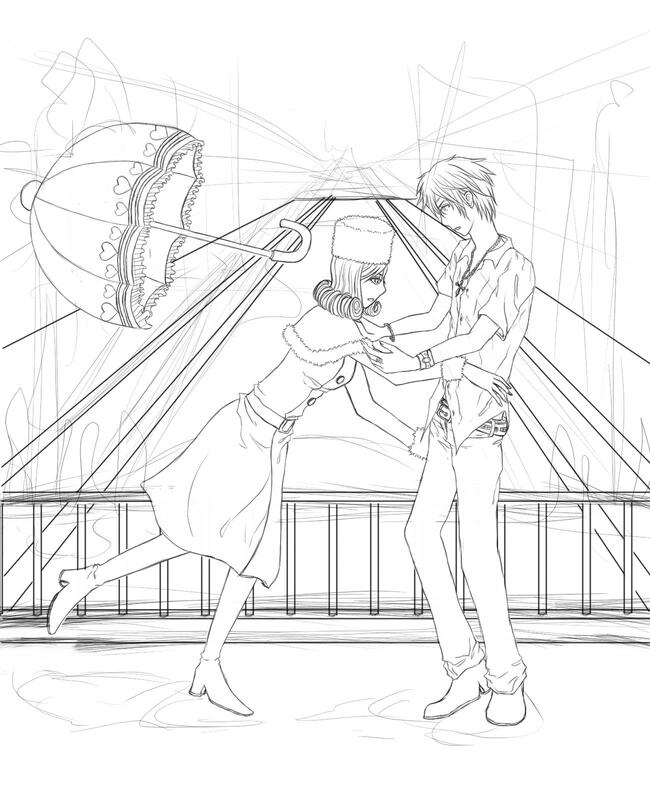 The layout of the background (perspective <3), and the way you've done the hair. 3. Is there something you don’t like? Emotion & movement. The lack of those takes away the main purpose of this image, resulting in me focusing my attention on other things (which would be the background and the flying umbrella). Wrinkles in the males clothes make it seem like his shirt is wet, but nice job with the girls, her’s are good! I liked what you did with the umbrella, having more objects around the vicinity (signs, lamps, bushes in pots), I think, would add greatly to this image (do not over detail them though if they are far away/not close, or the same will still happen where our focus is on objects rather than the main characters). However, before doing that you should focus on the characters placement and what they’re doing. You’ve got their looks down, but now we need something to tell us what’s happening. This is where gestures can play a key roll in your characters as it provides flow to them. Expressions can also make or break a piece. Don’t be afraid to exaggerate the mouth or eyes, or even the shape of the face can distort to help carry these along. As well, practicing expressions can help much with the characters personality and how we see them. 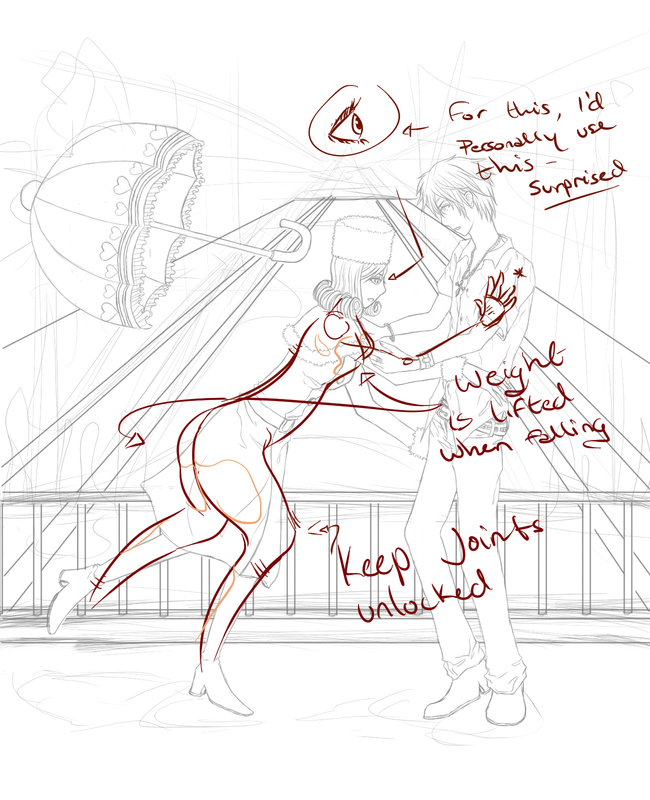 References would greatly improve these simple mistakes and doing some gesture sessions. I’ve redlined the girl for you (the second one is how I would have done, but then the male needs to be in a whole new position to accommodate the change) but as for the male I’m not over confident on how I would really go about him. I can only offer that you play out the roll yourself – what position would you be in catching someone that’s a bit shorter than you? I think he would be kneeling a bit more and try to grab her by the shoulders (like he’s doing) but his palms towards her. He’d be stunned for sure, his mouth probably open wider; also bracing for impact so his knees (maybe one leg behind him to balance) would most likely be locked/bent. I like the idea of this picture. It’s like one of those random photo’s you get by chance. I can agree that there are a few things anatomy wise which could be fixed, moogle did a great job of showing in the red line image she did. 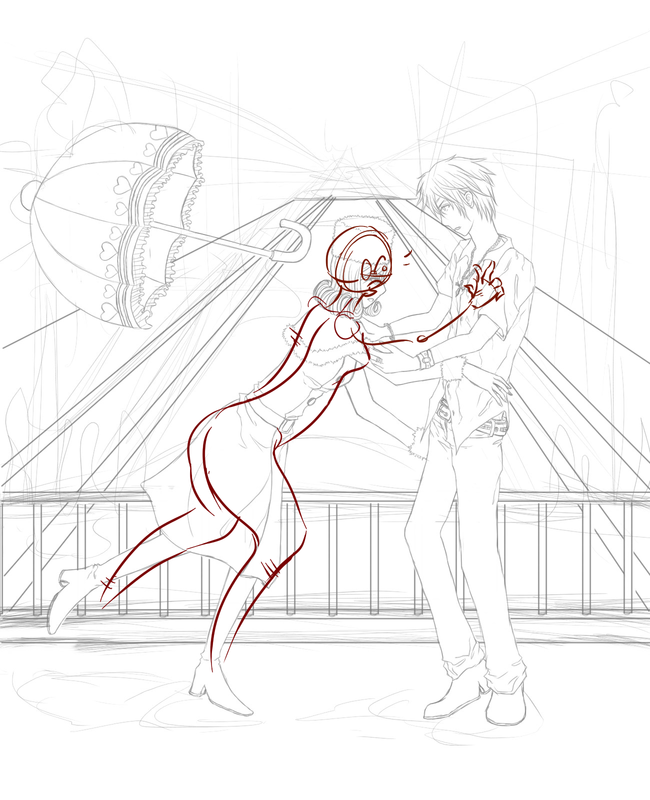 right now the background looks interesting as I wonder what is going to be there.